Find out what type of concrete sealer to use for different applications indoors and out. Like conventional concrete, stamped surfaces will provide decades of service when properly installed and maintained, even when exposed to harsh winter weather conditions. Color hardeners that are often used in the stamping process provide additional benefit by making the surface stronger and more resistant to abrasion and water penetration. Most contractors also apply several coats of protective sealer to block the penetration of dirt, chemicals, oil, grease, and other substances. Sealers also make the concrete easier to clean and prevent color fading from UV exposure. Sweep and wash the surface occasionally to avoid dirt buildup using a garden hose or pressure washer, push broom and a mild detergent. Rinse well with a garden hose on high pressure or a pressure washer. Scrub with a push broom and a small amount of liquid dish soap. Rinse again, making sure to remove all soap residue. Dry completely - allow 24 hours to air dry or use a leaf blower. DO NOT apply sealer to wet or even damp surfaces. Apply sealer using a 1” nap roller in 2’ x 4’ sections. Anti-skid additive can be added to the sealer. Recommended air temperature should be between 55 F and 90 F. Refer to manufacturer’s instructions on all products used. Apply a second coat when the first coat is no longer sticky to touch. Sweep and wash the surface occasionally. Wet mopping or dry dust mopping of the floor is typically the only routine upkeep needed. On surfaces subject to lots of foot traffic, it’s especially important to maintain the sealed surface to prevent wear patterns. Application of a sacrificial floor wax or polish can provide extra protection by protecting the sealer from wear and serving as a shock absorber to scuffs, scratches and grime. If a stamped surface begins to dull or lose its sheen after time, recoating with sealer will usually restore the luster. Ask the installer for recommendations of the best sealer to use. Avoid using deicing salts on outdoor surfaces, especially during the first winter after the pavement is installed. 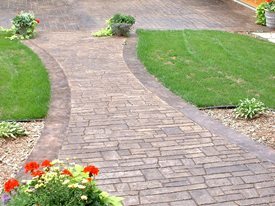 Sealers for decorative concrete often fail in areas where deicing salts are applied or that receive drip-off from parked cars. The damage isn’t caused directly by the salts themselves, but by the freeze/thaw cycles that the salts cause. See more on the Effects of Deicing Salts. Although sealers will inhibit stains, it’s still a good idea to remove spills, oil, grease, or other possibly damaging substances immediately.